Jacoby Ellsbury’s daring steal of home against the New York Yankees happened several days ago, but because related searches have brought many people to Bus Leagues since then, I thought it might be a good idea to post video of it here. YouTube has, as you might expect, been scrubbed clean, but Daily Motion had a quality clip of what just might be the most exciting play in baseball. Red Sox Monster was all about Ellsbury’s thirty-yard dash from the time it happened, including a nice breakdown of the various factors leading up to it. One thing I haven’t seen mentioned anywhere (although I admittedly don’t watch or read nearly as much sports news as I used to) is that this is the second time in three seasons that Andy Pettitte got burned on a straight steal of home. As documented on Awful Announcing, Toronto’s Aaron Hill (a former New Hampshire Fisher Cat) got him on May 29, 2007. 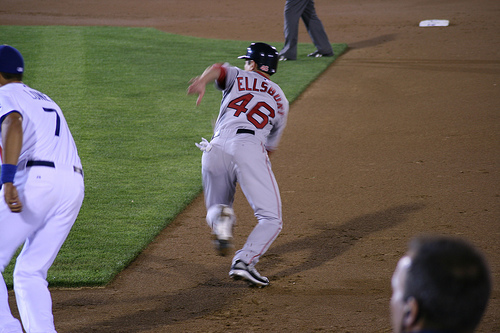 That play was arguably more embarrassing – with Ellsbury’s speed, you expected him to steal home someday. Hill, not so much. The really surprising thing, at least to me, is that this continues to happen even though Pettitte is one of the best pitchers of the last 35 years when it comes to picking off baserunners. I think ESPN said that he was second in that category since 1974, which makes you wonder how he has allowed two players in recent years to steal home on him. Many of Baseball America’s Top 100 prospects continue to see steady playing time in the major leagues; unofficially, I count 40 who have gotten themselves into a game this season. Some, like Geovany Soto, have performed admirably for long stretches at a time; others, like Homer Bailey, got a shot but proved that they weren’t quite ready for The Show. In keeping with the tradition started in early May, I’ve run through the game logs of every Top 100 prospect who has played in the majors this season and highlighted the best outings (one caveat: players are only allowed one entry on the list). The first seven are holdovers from the previous list, in chronologial order; the bottom three are newcomers, the best prospect games since May 9. I’m still not sure what will happen with these as the season progresses. If the interest is there, we might put it to a vote at the end of the year and determine the best Major League Performance By A Top 100 Prospect, or something of that nature (I like the idea of year-end awards, now that I mention it…). Thoughts and suggestions are welcome. Jacoby Ellsbury, the 13th ranked prospect according to Baseball America’s preseason list, has been on the major league roster of the Boston Red Sox for the entire 2008 season to date, one of about eleven names on the Top 100 to do so. * That makes him one of those guys that occasionally slips through the cracks at Bus Leagues: Ellsbury is clearly a major leaguer at this point, but his place on the Top 100 “allows” us to write about him if we so choose. *The other ten: Joba Chamberlain (3), Kosuke Fukudome (30), Johnny Cueto (34), Joey Votto (44), Geovany Soto (47), Daric Barton (48), Jair Jurrjens (49), Carlos Gomez (52), Nick Blackburn (56), Manny Parra (72). Am I leaving anyone out? Only players who made their team out of spring training and have not been demoted are included. Ellsbury is in the news today, not surprisingly, for his legs. Yesterday afternoon in Cincinnati, he stole two bases to tie the Red Sox team record for stolen bases by a rookie. Today, in the very first inning, he rolled a single through the hole between short and third, then stole second on the very first pitch to Dustin Pedroia to break the mark, which had stood since 1908. Ellsbury then stole third and scored on Pedroia’s sacrifice fly. In breaking the record, Ellsbury victimized fellow top prospect Homer Bailey, making his third start for the Reds. Bailey did not have a good afternoon, allowing five runs in 2.1 innings pitched, including three homeruns (Ellsbury, Coco Crisp, J.D. Drew). His ERA currently stands at a healthy 8.76 after three starts and the team is concerned with a serious decrease in the velocity on his fastball.